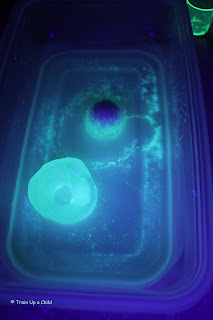 Today's guest post is from Allison of Train Up a Child. She is a homeschooling mom to four boys and her blog is filled with fabulous learning, fun and play! Her recent Painting in the pool post sums up a lot of who they are - the photos put such a smile on my face. Her boys had a wonderful time and it shows. Allison and her boys have been having lots of glow fun lately and I am so happy she is sharing a bit of that here with you today. So, without further delay...here's Allison! What a privilege to be posting on one of my favorite blogs today! Thank you Bern, for this opportunity. My name is Allison, and I blog at Train Up a Child. I have four sons ages 5, 3 and 11 month old twins. This time of year many moms struggle with wanting to avoid Summer Slide yet wanting their kids to have a break and play! My solution to this is to meet in the middle and set up opportunities for learning and reviewing, all while having a whole lot of fun! My oldest just turned five, and I have been introducing coin values to him. 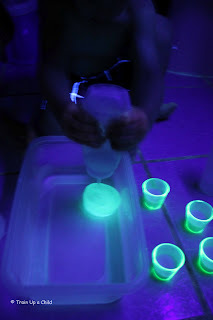 I am a firm believer in the importance of sensory play, and I do my best to incorporate learning while engaging as many senses as possible. 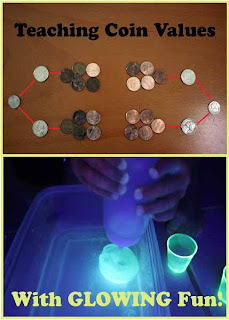 One way we love to learn is through play in the dark! 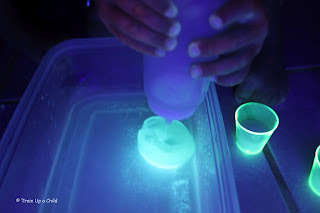 We recently made GLOWING ice. My boys had so much fun with it, that I decided to make another batch, this time including some money review. I froze 20 pennies, 4 nickels and 2 dimes in glow water. 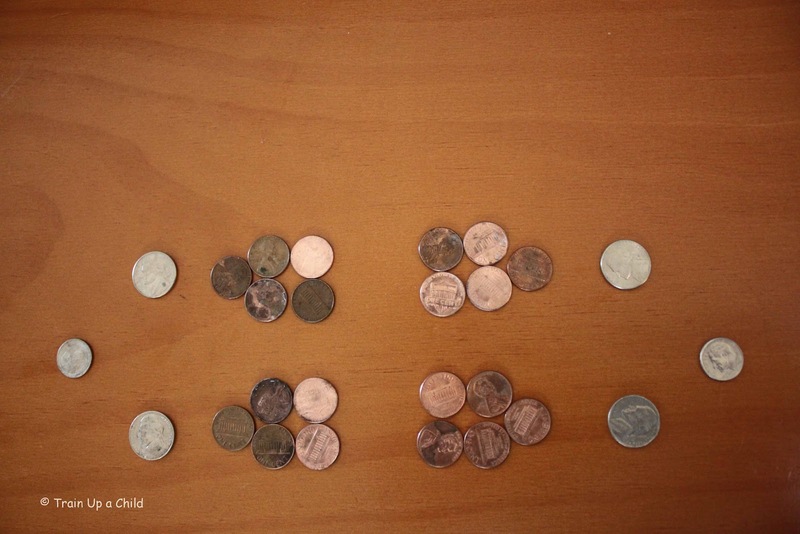 I used muffin tins to freeze the coins. I put the pennies in a mini muffin tin, and I froze the nickels and dimes in standard size tins. I filled squeezy bottles with water, one cold, one room temp, one warm, and one hot. I also filled four glow in the dark shot glasses (purchased at Dollar Tree) with salt. The boys were delighted to spray the ice and excavate the coins! They squealed with excitement each time a coin came free. We discussed the temperature of the water in each bottle, and they quickly learned that the hotter the water, the faster the ice melted. J-Bug really enjoyed dumping the salt on blocks of ice, but JZ preferred spraying the hot water. 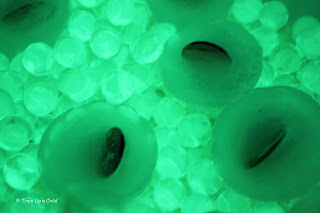 Before all the coins were free, they requested adding the ice to our sensory bin full of GLOWING water beads. They continued to retrieve each coin as it was freed from the melting ice. After all the coins were collected, (and after some water bead play), my five year old sorted the coins and counted the values. We kept it short and simple, and it helped tremendously to reinforce what he has learned. We love exploring in the dark. 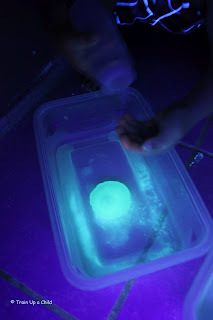 Here are some other ways we've enjoyed Glow in the Dark play, including our recent glowing JELLO experiment. Allison is a homeschooling mama to four young boys. She writes about their homeschooling journey, Christian parenting, and creative ways to play. She believes in hands on learning, spending most of the day outside, and the importance of messy, sensory play. 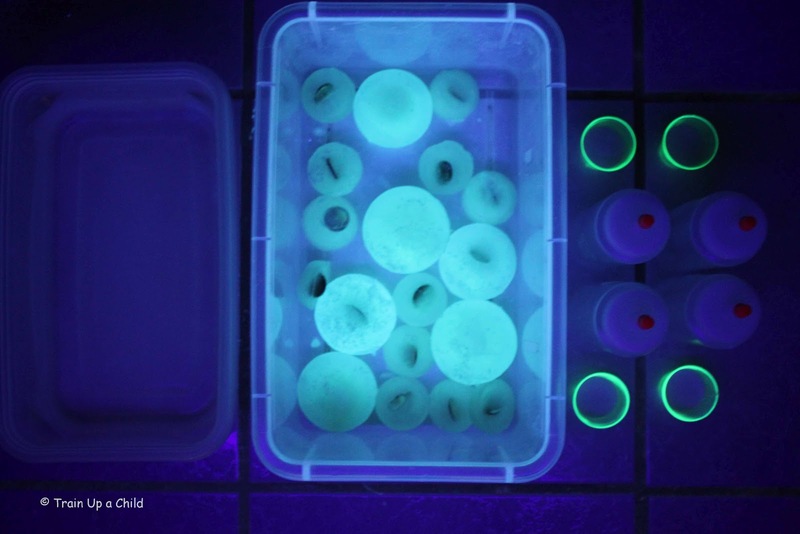 It's always a pleasure to read a post by Allison! Thanks for having her guest blog.